An interesting take on a classic platform. 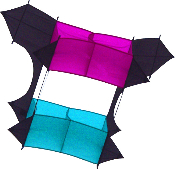 This multi colored box kite is sure to attract attention! Sam Franklin Cody was an aeronautics pioneer who designed and flew the firs airplane in England in 1908. His famous Cody winged box kite shape was successfully designed for man-lifting experiments which helped in the development of powered flight.